Do it Yourself following this detailed itinerary. 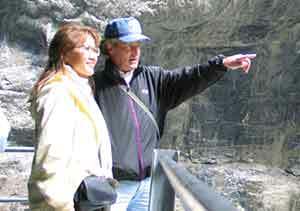 We have carefully planned and conducted this tour many times and are now giving away the secrets of how you can do this tour on your own. It is not difficult because you will be taken care of by Swiss efficiency in the hotels, trains, mountain lifts, restaurants, shops and on the street. Go for it. This customized itinerary has been carefully created to include the most scenic parts of the Alpine region, and the most beautiful towns: majestic pinnacles towering over green foothills, with little villages nestled at their base in green meadows. We suggest you stay for several nights in each place, which gives you time to have a good look around. You shall see it all in this visit. Touring Switzerland is almost like visiting all of Europe in one small country. 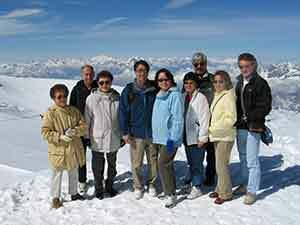 Switzerland is a fascinating mix of French culture in the west, German in the east and Italian in the south. 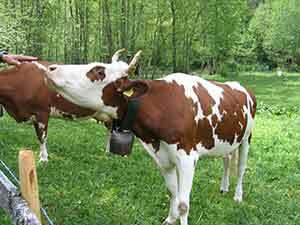 Most Swiss also speaks English, so you will have no trouble communicating. 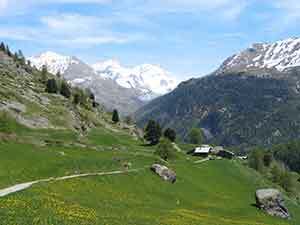 The towering Swiss Alps will be our main attraction, with time for some easy downhill walks on scenic hiking trails. You will also discover quaint villages with cobblestone lanes for pedestrians winding past ancient buildings that have the most modern shops inside, with everything spotlessly clean and well organized. This is the land of efficiency and charm, with very friendly people. The best of both worlds, old and new. Our visit begins in Lucerne, one of the world's prettiest towns, set on a beautiful waterfront, along the shores of Lake Lucerne and the River Reuss, surrounded by majestic mountains. They truly have it all. Lucerne is deservedly the most popular destination in Switzerland, famous for its well-preserved Old Town, consisting of many blocks of medieval buildings richly decorated with painted murals showing village life in olden days, making this like an outdoor art gallery. Two days will be plenty of time to enjoy Lucerne, using it as your home base for travels by train and boat to nearby sights. 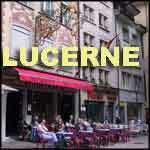 Temperatures are very pleasant in May, reaching the 60s and 70s, for Lucerne sits at an elevation of just 1,300 feet. Some of the nearby mountains do reach 10,000 feet, with snow-covered glaciers, but the temperatures in town are very comfortable. 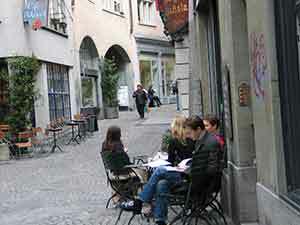 Many restaurants and cafes have outdoor seating in fair weather, some of them on the beautiful banks of the Reuss River that flows through town, so it is really nice to sit in the fresh air and enjoy your meal. Day One: walking tour in the Old Town. Day Two: trip to the top of Mt. Titlis; afternoon free for shopping alternative options, boat ride and excursions to Rigi, Pilatus. DAY ONE: Explore the town. We will arrive in the afternoon, and after resting up at the hotel, take an orientation walk. The historic center of Lucerne is an extensive pedestrian zone, filled with interesting shops, restaurants, and ancient buildings. The steep gabled roofs, covered with strong wooden shingles to ward off the winter snow, complete the picturesque scenario. Automobiles are not allowed into this large historic zone, so you can wander the cobbled lanes without fear of getting run over. 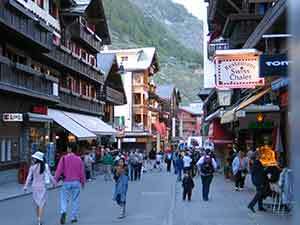 The shopping is fun, with many items that are pure Swiss in character, like music boxes, chocolates, watches, cuckoo clocks, cowbells, beer steins, hand-carved wooden statues, costumed dolls, cheese, knives, embroidery, linens, music, and you can also find very good deals on clothing. The two main watch shops are Bucherer, a multi-story extravaganza, and Gubelin, facing each other on the lakefront at Schwanenplatz. You can't get lost in this small place - the Old Town is surrounded on one side by the river and lake, and on the other by a hillside and ancient fortified wall, which you can climb. Feel free to wander. In the heart of Lucerne is its major landmark, the 560-foot long Chapel Bridge, or Kapellbrucke, the oldest covered bridge in Europe, first built in 1333. But in 1993, after 660 years, this Lucerne icon was destroyed by fire, only to be rebuilt by the efficient townspeople within a year in the original style - and by now has weathered to a mellow patina that once again looks hundreds of years old. The heroic rise from ashes symbolizes Swiss pride in their past and modern ability to get things done. Even here, it sometimes takes forever to repair old buildings or construct new ones, but the quality upon completion is unsurpassed. Adjacent to the bridge is the 110-foot high Water Tower, also nearly 700 years old, the most photographed image in town. For the best picture, lure some swans into your foreground with the bridge and tower behind. The Mill Bridge is a smaller covered bridge two hundred yards south along the river, built around 1408, notable for its series of paintings, "The Dance of Death," whose jangling skeletons of the Black Death make you feel lucky to be alive. The clever Swiss have once again harnessed the waterpower that originally gave this bridge its name, and created a modern electricity-generating turbine, underwater and completely invisible. 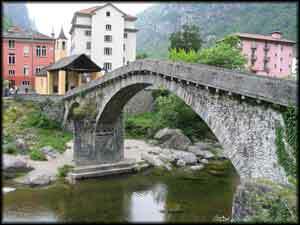 Both bridges also served as part of the medieval fortifications that surrounded the town. The old fortification wall still survives from the Middle Ages, built around the same time as the two bridges, between 1350 and 1408. Called the Musegg Wall, it has nine towers, three of them open free to the public, and a section of wall you can walk along for the most spectacular view looking down on the town. This is worth your effort, and easy to find, with a path just beyond the Mill Bridge that takes you there. The other landmark we shall see on our orientation is the huge Lion Monument, carved deeply into the sandstone cliff to commemorate the 1792 death of 786 Swiss mercenary soldiers that were trying to defend King Louis XVI in Paris. Completed in 1821, it depicts a noble, mortally wounded lion, regal but dying from a spear thrust in the ribs, making a grand tragic statement of historic pride carved in stone. Mark Twain toured Lucerne and called this "the saddest and most moving piece of rock in the world." 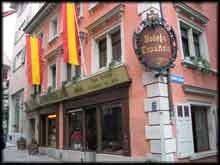 The Old Swiss House, one of the best restaurants in Lucerne, is located in front of the Lion Monument, so have a look at their menu and consider having a gourmet meal here on one of your nights in town. 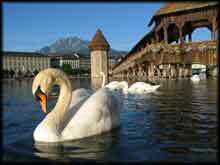 With its traditional half-timbered wooden beam construction dating back to 1859, this is truly a landmark of Lucerne. They serve the best Wienerschnitzel, sinfully sautéed with a stick of butter right at your table, or superb fresh fish from the lake, and many other items from an extensive menu. Comfortably elegant, the cozy interior is a perfect setting for a memorable meal. The Hoffkirche, or Collegiate Church, is another attraction in this part of town, on a hill overlooking the lake, four blocks south of the restaurant. 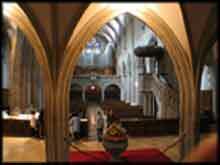 This Catholic church was built in the gothic and Renaissance styles during the 17th century and has a rich interior with many carvings and wrought-iron works, and a cloistered courtyard next door. Walk the few blocks back into the center of town along the main pedestrian shopping street, Hertenstein-Strasse, and head for the Kornmarkt, a small square with the Old Town Hall, built in 1602 with two distinctive styles that mirror Swiss cultural heritage: Italian in the lower section, echoing the Florentine Renaissance, and a Bern farmhouse wooden shingle pitched roof. An excellent restaurant for simple Swiss sausage meals is here, Pfistern, with a rustic wooden interior, or tables outside on the lower terrace along the river. The Picasso Museum is also on Kornmarkt, with a display of prints by the modern master and 8 paintings. You will discover several small plazas in the middle of the Old Town, where cobblestone pedestrian lanes come together and form a charming open area, ringed by ancient buildings and sidewalk cafes, with a fountain in the middle. 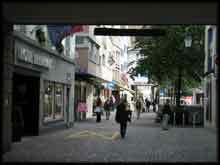 Small independent shops, and a few department stores, make this the prime retail section of town. DAY TWO: Train to Mount Titlis; boat ride. 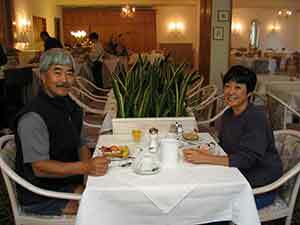 Enjoy your rich buffet breakfast that most hotels in Switzerland offer, and relax over coffee. Be sure to try the dark breads if you are a whole-wheat fan, made fresh each morning in the town's excellent bakeries. 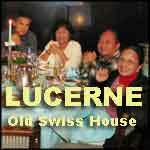 Lucerne is in the German-speaking eastern part of Switzerland and they love dark bread. The banks of Lake Lucerne offer a most picturesque walk, through manicured gardens, past picnickers, swans, fishermen, bobbing boats, and tree-lined paths. This stroll is especially dramatic at sunrise, when the water turns to gold. 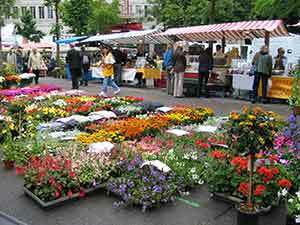 On Tuesday and Saturday mornings you will see the farmers' market, with cheeses, breads, fruits, produce and pretty flower stalls, which stay open through mid-day. After the refreshing sunrise excursion head back to your hotel for breakfast and prepare for your day's activities. 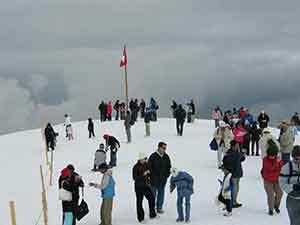 The most exciting, convenient excursion out of town is to Mount Titlis, where you get a chance to frolic in the snow at the top of a mountain, just two hours from Lucerne. 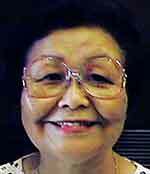 Because it has a glacier at the 10,000-foot summit, there is snow all year round, so it is really a thrill to go up in the summer time and play, especially for us Hawaiians. It is very easy to get there. 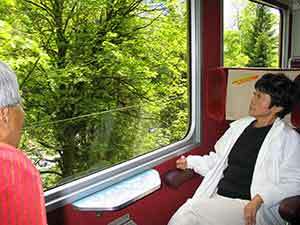 Take the scenic train one hour to Engelberg, enjoying beautiful views of the mountains, farms and villages along the way. At one section this becomes a rack railway, where the train gears engage a metal strip between the rails and pull the train up the steep incline, giving you a chance to walk the aisle leaned over at 45 degrees, if you want to clown around. In Engelberg follow the signs and walk a couple hundred yards to the cable car lift that will take you on the 45-minute ride up the mountain. The combined rail and lift ticket costs about $60. 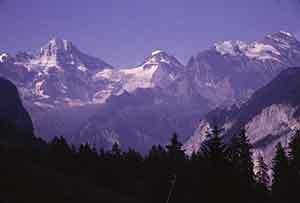 Mount Titlis provides a spectacular view into the heart of the Alps, with lofty peaks of the Jungfrau, Munch and Eiger visible in the distant Bernese Oberland on a clear day. 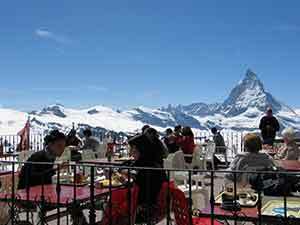 The Titlis viewing platform at 10,000 feet has an elaborate multi-storied restaurant, café and gift shop complex, along with an ice tunnel into the glacier. In typical Swiss fashion, they have civilized this mountain peak like so many other similar perches in their realm. 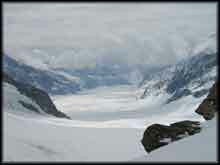 You can walk right onto the glacier from the panorama terrace and frolic in the snow. It is cold enough that the snow never melts, but in the summer with typical sunshine you will feel comfortable with just a light jacket. For more fun on the trip down, get off the cable car at the next-to-last stop and rent a scooter ($5) to coast down the final mile. We return to town the same way, enjoying the scenery a second time in reverse, or take a snooze. We will be back in town before 3:00pm, which leaves some time for more shopping, or to take a boat ride. 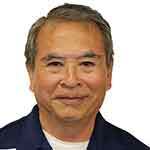 Depending on your interests, you could save the boat for tomorrow, which gives you more time for a longer excursion. If you would just like a short two-hour ride, now is a good time. 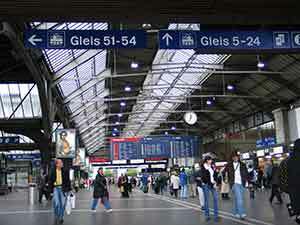 The boat docks are right in front of the train station, with frequent departures. 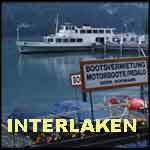 Check their exact schedules on-line at www.lakelucerne.ch. 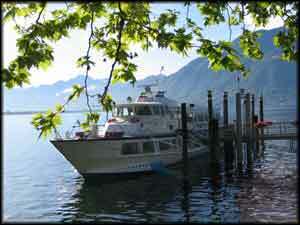 You can spend a very pleasant afternoon enjoying a boat ride on Lake Lucerne. 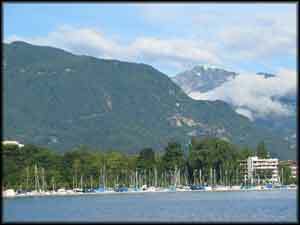 Various pleasure boats operate on the lake, and you can ride them 45 minutes across the water to the little villages of Weggis and Vitznau. Each of these towns have a number of cafes along the water where you could have lunch or afternoon tea while waiting for the next boat back to Lucerne. Tonight, try the dinner show at the famous Stadtkeller in the heart of the Old Town, where you will be totally entertained by traditional Swiss music, with costumed performers yodeling their hearts out, throwing colorful flags around, playing spoons, bottles and brooms, and just putting on one heck of a lively show. 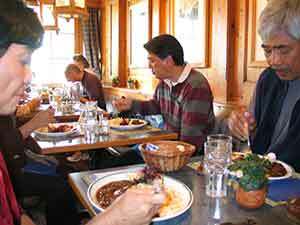 The food is very good, with a choice of traditional items like bratwurst, Wienerschnitzel, sliced veal in mushroom cream sauce, fondue, chicken or fish, accompanied by rosti potatoes, which are similar to hash browns but better. DAY THREE: Boat ride, and more exploring in town. 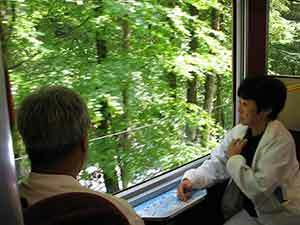 A superb combination boat and funicular ride brings you on an optional trip to Mt. Pilatus, the mountain that towers over Lucerne. Take the boat from the dock in front of the Lucerne train station to Alpnachstad, which takes one hour and ten minutes, then ride up the world's steepest cog-wheel railway to the top of Pilatus for a sweeping view of the lake and Lucerne. They do have a nice rustic restaurant, and there is even a hotel at the top. 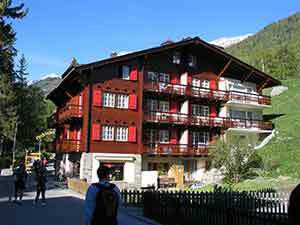 You could return the same way, or for a slightly faster alternative with a different routing, take the cable car down the back side of the mountain to Kriens, and walk a few blocks to the city bus stop that will whisk you back into town. You could take a longer boat ride and go all the way to the end of the lake at Fluelen, which takes about 3 hours, and then take a one-hour train ride back to Lucerne. No matter which route you decide upon, you will be rewarded with a relaxing experience and wonderful scenery along the shores of the lake. Light refreshments are served on board, and some of the larger ships have a restaurant with typical Swiss cuisine. There are several large, old-fashioned paddle wheelers that offer an elegant atmosphere that hasn't changed in the last hundred years. If you have a Eurail Pass the boat rides are free, or if you pay, the price varies between $15 and $100 depending on your route and whether you go first class or second. We call it Lake Lucerne, but the Swiss name is Vierwaldstattersee, which means "lake of the four forest cantons," referring to the four communities that joined together back in at the start of the 14th century and created the beginnings of Switzerland. This takes us back to the time of the legendary William Tell, who defied the ruling Hapsburg authorities and was then forced to shoot an apple from his son's head, leading to a rebellion that ousted the corrupt government and to Swiss independence. Since that medieval confederation of Uri, Schwyz, Unterwalden and Lucerne, 19 more cantons (states) joined the nation, which reached its present size after the start of the 19th century and the defeat of Napoleon. A thousand years of complicated intrigue and changing alliances have resulted in the modern country we find today, neutral and secure in the middle of the Continent. 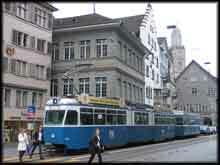 You can do one of the lake excursions and still have time in Lucerne for shopping, or visiting a museum. The Swiss Transportation Museum is the largest such display in the country, but it is best for those who are very interested in seeing many kinds of old trains, cars and planes. 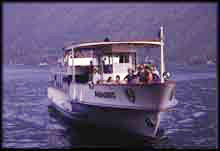 It is two miles outside the city and can be reached by public bus, or boat. There is also a small section of the Old Town on the other side of the river, so walk across one of the pedestrian bridges and have a look around the area near the Jesuit Church. This pretty church, built between 1666 and 1673, was influenced by the Italians, decorated in the baroque style by Toriano and Toricelli, two artists from the Italian-speaking southern part of Switzerland. Next door is the Ritter Palace, originally used as a Jesuit residence, but later converted into Lucerne government offices. 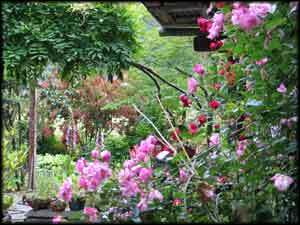 It has a surprising Tuscan courtyard on the interior, so stop in for a free look. Another nice attraction of this side is our favorite chocolate shop, Au Chocolat, on Pfister-Gasse Street. They fill the pralines by hand with sinfully rich creams that will melt your soul with delight. Also called truffles, the stuffed chocolates of Lucerne rival those of Belgium, and will stay fresh for a few weeks, so they are an excellent present to bring home. The History Museum on the same street has a small display about the region. 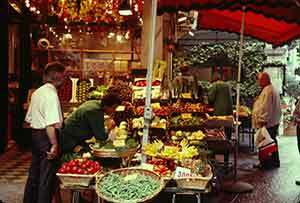 There are many dinner options in Lucerne, ranging from a simple sausage meal to a full-on gastronomic extravaganza. 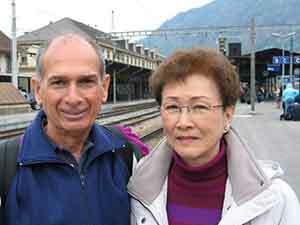 We leave Lucerne after breakfast and catch the train to Interlaken, enjoying a very scenic two-hour ride through beautiful mountains, and along the shores of Lake Brienz. Some of the world's most spectacular mountain scenery is waiting for you just outside of Interlaken in the heart of the Swiss Alps. Here is nature at its very best, and you don't need to be an athlete to enjoy it because the Swiss make it easy to get up the highest peaks with their efficient network of trains and cable cars. They have civilized the wilderness with restaurants and observation platforms that provide comfortable facilities so you can relax, have a drink, and enjoy the eye-popping views of giant mountains, vast glaciers and splendid valleys. If you like to hike, you will be able to get that much more out of the experience, for the region has a vast network of trails ranging from simple paths to mountain-climbing ascents. There is so much to see and do we are spending three full days here, filled with a variety of activities. 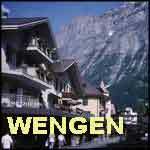 - Europe's longest glacier - Four famous peaks, the Mönch, Eiger, Jungfrau and Schilthorn - Astonishingly beautiful Lauterbrunnen Valley - Europe's highest railroad station - Delightful mountain villages of Grindelwald, Wengen and Murren - Two large lakes with tour boat service and - Fascinating nearby cities. 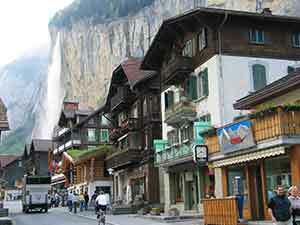 All these attractions are close to the town of Interlaken, which makes a perfect base from which to explore the region. 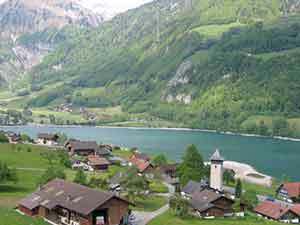 Interlaken is a practical tourist center with fine support services, excellent rail and boat connections, and a compactness that makes for easy to walking anywhere in town. There is also a large casino filled with slot machines for some evening amusement. 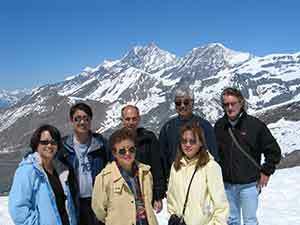 The nearby surrounding peaks and valleys are your main reasons for being here, so our time in Interlaken is mostly for eating and sleeping in order to gear up for excursions into the mountains. Three Days at Interlaken....DAY ONE: Jungfrau and Grindelwald. 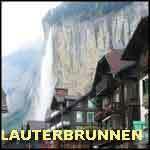 DAY TWO: Lauterbrunnen and Schilthorn. DAY THREE: boat ride, and Bern. Weather is always a major factor for determining our schedule in the mountains because we do not want to spend time and money going to the top on a cloudy day when you can't see anything. 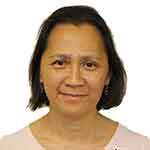 This is another good reason for spending a three days here - to increase the chances of good weather. 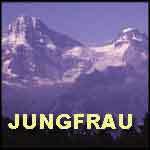 If the reports from the Jungfrau summit look good this first morning, we go for it, because it might cloud over tomorrow. 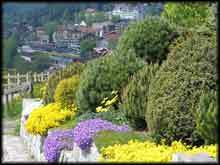 Temperatures in Interlaken are mild in May. Europe's highest railroad line will bring you up to a spectacular world of perpetual winter, dominated by massive, snow-covered peaks reaching over 13,000 feet high and surrounding the continent's longest glacier. Many consider the train ride up one of the finest, most picturesque in the world, where getting to the top is half the fun. We begin the journey shortly after breakfast because it takes 2 1/2 hours to reach the Jungfrau summit, where the weather is generally clearer in the morning, and longer to get down via an alternative route, so with various stops along the way you are going to have a full day. There is train service every half-hour departing from the Interlaken Ost rail station, on the east side of town just a few blocks from our hotel. To get the best views on this train journey, you need to know where to sit and what to look for; otherwise, you could completely miss the most spectacular sights. The rail journey's first leg is a 20-minute ride from Interlaken to Lauterbrunnen, and already the scenery is nice, especially if you sit on the left side of the train and carefully stick your head out the window to look forward as the train leaves the residential neighborhood and enters the narrow mouth of Lauterbrunnen Valley, with the river rushing alongside and the steep mountains framing your view. Change trains in Lauterbrunnen for the second leg of the journey, up the longest cog railway in Switzerland. The ride begins with a dramatic 14-minute ascent that offers astonishing panoramic views of the valley below as you travel up to the village of Wengen, perched on the side of a steep mountain. As the train climbs up the side of the mountain you can see a majestic vista of the deep green Lauterbrunnen Valley, framed by steep hillsides dotted with farms and massive snow-covered peaks in the distance. You will have a lovely journey to the rail junction at Kleine Scheidegg, where you catch the third and final train that will bring you to the top, rising from an elevation of 6,762 feet up to 11,333 feet, Europe's highest train station. This hundred-year-old rail line from Kleine Scheidegg to the Jungfraujoch is one of Europe's great engineering wonders, the world's highest subway climbing through four miles of tunnels inside the rock. The beginning of this 50-minute journey is not underground, and momentarily offers a great view; so sit on the right side of the train. 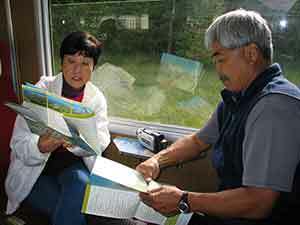 The train makes two brief stops enroute to let everyone out for a walk through short tunnels to viewing stations, where you look through windows at the nearby mountain peaks and the landscapes far below. Upon arrival at the end of the rail line, you walk through an ice tunnel decorated with ice carvings and then approach a sight too amazing for description or film. You really have to pay your dues and go there in person to experience the exhilaration of standing at the top of the world, surrounded by Alpine giants of snow. 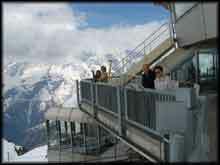 The observation deck and snowfield are at 11,350 feet, flanked by the jagged peaks of the Jungfrau (13,642 ft.) and the Mönch (13,449 ft.), which form a valley that cradles the Aletsch Galcier, an endless field of snow that stretches 13 miles to the horizon. It is a mind-blowing sight! One is intoxicated with appreciation of this vista and amazed by the excellent Swiss technology that delivers you here to such a comfortable viewing platform. There was no effort at all - you just enjoy the ride and are suddenly transported to this other world. After walking around on the snowfield, it's nice to go indoors and have a meal in the cafeteria or the restaurant and do a little souvenir shopping in this very civilized visitor center. If you feel like skiing, there is a gentle slope open year-round, complete with a school for beginners. But you still haven't reached the top until you ride the elevator another 356 feet up to The Sphinx, the Jungfrau's highest platform (11,700 ft.) offering an unobstructed view in all directions. This modern building opened in 1996 and functions as a scientific research center as well as a public lookout. The air up here is extremely clear, with only 5% of the dust and humidity found at lower altitudes, making for very crisp conditions. Temperatures are just below freezing, but on a mild, sunny day it is quite comfortable, and there is always hot chocolate waiting for you in the café. Plan on spending an hour at the top, playing in the snow and exploring the various levels and exhibits of the visitor center, then catch a convenient train back down the route you came. 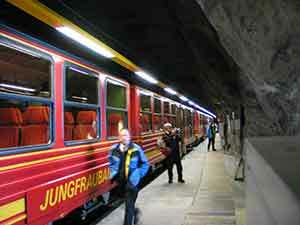 We return to Kleine Scheidegg and change trains for a different return route through Grindelwald. The route down to Grindelwald and back to Interlaken is another beautiful ride through stunning mountain scenery, completing a circular route that doesn't repeat itself but always reveals something new. 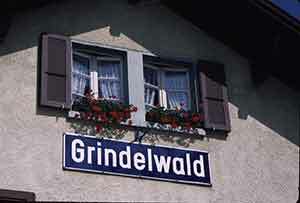 Grindelwald is another small, quaint mountain village, most famous as a home base for mountain trekkers. There are nearly 200 miles of hiking trails that reach out from here, some of which are reached by cable car, or any of a dozen routes that extend directly out from the village. A popular route is the 20-minute cable car ride to the First Station, where you can pick from three excellent mountain trails of varying difficulty. 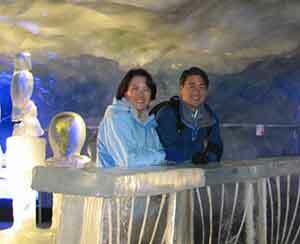 There is also an imposing glacier gorge and the mysterious Blue Ice Grotto to explore, close to the village. If you don't feel like hiking, just find a terrace café with a view of the mountains and sit back to relax with a drink and some local snacks. This can be a busy little village, with tour buses running up and down the main street and small crowds of people here and there, so the center of town might not be all that peaceful; but it is easy to find charming outdoor restaurants a few blocks away with stunning views of mountains so close it seems you could reach out and grab them. While the village center may be ordinary, the stunning landscapes all around are so spectacular they just might entice you to come back for a few days, after you have completed exploring some of the other great attractions around Interlaken. It only takes 35 minutes for the train to reach Interlaken on a direct route from Grindelwald, and of course there are more dramatic landscapes to admire along the way. One truly outstanding choice for a memorable meal in Interlaken, outdoors with a view of the mountains you have just conquered, is the Grand Hotel and Spa Victoria-Jungfrau, a famous resort with reasonable prices on the dining terrace. We'll get an early start for another big day in the mountains, traveling to the back of Lauterbrunnen Valley and taking Europe's longest cable car ride up to the Schilthorn mountain. 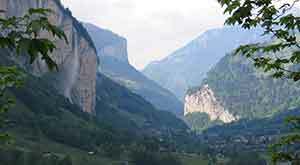 It's the same 20-minute train ride as yesterday from Interlaken's East station to the town of Lauterbrunnen, and then take the public bus on a scenic 20-minute ride to Stechelback where the cable car begins. That bus from the train station to Stechelback takes just 20 minutes, driving through the spectacular, green Lauterbrunnen Valley, whose high vertical walls and flat floor were carved out by glaciers eons ago, resembling a deep U-shaped canyon. We could get off the bus halfway and pay a small fee to visit the powerful Trummelbach waterfall, which comes roaring down from the Jungfrau, Eiger and Mönch high above. There is an elevator inside the waterfall (those Swiss engineers!) 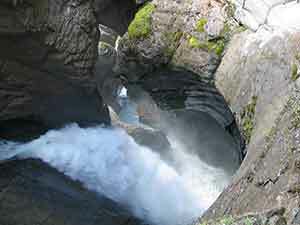 along with a series of tunnels and bridges to bring you right up to the face of this raging vertical river. The valley has 72 waterfalls, but Trummelbach is by far the most spectacular. This is an easy visit, and you walk back to the road and catch the next bus coming through to Stechelback, where the long cable car ascent begins. Four different cable cars are needed to get up this highest cable run in Europe, from an elevation of 2,844 feet at the beginning to 9,748 feet on top of the Schilthorn mountain. The views from the first stage of this cablecar ride are so fine they alone would make the day worthwhile, looking out the length of the valley and to the waterfall and dramatic rock cliff a few feet from the gondola. We change cablecars in the villages of Gimmelwald and Murren along the way, gaining different perspectives on the mountains. We can stop off for a quick look at the tiny hamlet of Gimmelwald, with its few scattered chalets for the 140 residents, and then continue to the top of the mountain by the next cablecar. 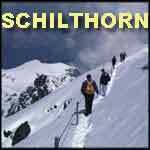 The Schilthorn is worth the effort, for you will be in the middle of a massive range of snow-covered peaks that stretch to the horizon, offering what some feel is the best mountain view in Europe. On a clear day a vast panorama of over 200 high mountains extends all around you, reaching from Titlis to Mont Blanc and all through the Bernese Oberland. The Swiss engineers have done it again with superb facilities at the observation center, including a rotating restaurant and escalators to bring you to the different levels, all run by solar power. Have a snack or a simple lunch in the self-service cafeteria while soaking in the amazing view. A large outdoor terrace provides an excellent vantage to look back across the valley at the three great peaks you visited yesterday, the Jungfrau, Mönch and Eiger, whose complete forms can be seen better from this distance than close-up. Be sure to walk out into the snowfield following the guided rope trail along the crest of the ridge to immerse yourself in the environment, rather than merely looking at it from the deck. Then cap it off with a drink in the Crystal Lounge and imagine watching James Bond in the frantic chase scene from On Her Majesty's Secret Service, filmed here in 1969. The view from the Schilthorn is just as spectacular as the view from the Jungfrau, but different in its own way, with that amazing panorama of peaks all around. 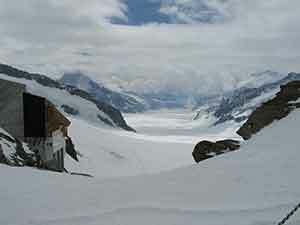 While the Jungfrau observation deck is about 2,000 feet higher, with that endless glacier, both mountains are covered with snow all year round and give spectacular views of mountains, glaciers and valleys. On a sunny summer day the temperatures hover around freezing but usually feel quite comfortable when you are properly dressed. After an hour head down in the cable car to Murren, a quaint village with some excellent restaurants and more views. This is one of the few automobile-free villages in Switzerland, so it makes for a lovely stroll, especially with the amazing views across Lauterbrunnen Valley towards the Jungfrau. It only takes ten minutes to walk from one end of Murren to the other. 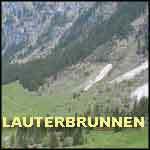 We next travel 2 1/2 miles from Murren to Grutschalp and take the funicular down to the train station in Lauterbrunnen. You could do this either by walking for 90 minutes through picture-postcard scenery along the smooth path, or by riding the little narrow-gauge train. It is one of the easiest Alpine strolls, with a mild downhill slope that gently pulls you along, fueled by sights so pretty it will be an effortless glide. 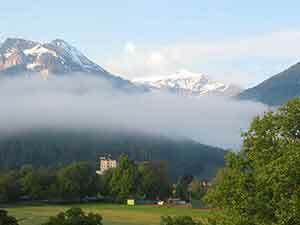 You will return to Interlaken by late afternoon, leaving time for more adventures. After a rest at our hotel, you could head out to a variety of different fun activities. If you are too pooped from this big day, just pick from among the dozens of fine restaurants in town to enjoy a leisurely meal, perhaps take a pass at the Casino, then turn in to rest up for your final big day. Or, you may crave to visit the top of yet another mountain, which can be quickly done with an 8-minute funicular ride from the Interlaken Ost rail station to Harder Kulm, which offers nice views of the Eiger, Mönch & Jungfrau, as well as Interlaken and its two lakes. Maybe you would enjoy an evening boat ride on Lake Brienz, a three-hour round-trip cruise that leaves the dock next to the east rail station at 7:30 p.m. Dinner is served in a lovely restaurant on board as you cruise along, passing a number of quaint villages. The sun sets at about 8:00pm in May, so there will most likely be golden lighting for much of the way. By now the two main mountain activities have been covered, but there are many more exciting activities to choose from on this third day - so many tempting options, you might decide to stay three days longer! Rather than lay out one specific plan here, we suggest various excursions to pick from and leave the selection to you: hiking, boat rides, or scenic train trips to nearby cities. Dozens of splendid hiking trails in this region could keep you strolling on different paths for weeks. The most scenic network is found back in the Grindelwald area, just 35 minutes from Interlaken by train, as described in the first day's schedule. One of the most popular hikes there involves taking a cable car from Grindelwald to Pfingstegg, and then walking for 90 minutes to Stieregg at 5583 feet elevation, where you can enjoy panoramic views of glaciers and mountains while relaxing at the restaurant and observation terrace. Then retrace your route back down. 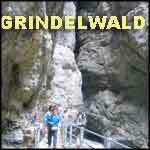 You will find many other scenic routes in the Grindelwald area. 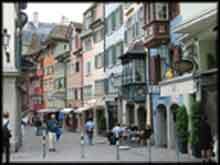 Two large lakes, Brienz and Thun, each with numerous recreational and sightseeing opportunities, flank Interlaken. Lake Brienz, or as the Swiss call it, Brienzersee, can be explored with a combination of boats, trains, and hiking, depending on how ambitious you feel. It takes 70 minutes to ride the boat from Interlaken to the town of Brienz, noted as a center of woodcarving and as a gateway to the Rothurn Kulm, a mountain 7,433 ft. high, reached by a steam locomotive cog-railway. As usual, there is a summit restaurant with terrace and some easy walking trails to enjoy. A different set of options awaits you on the other lake flanking Interlaken, Lake Thun. Here too are peaceful boat rides to quaint villages along the shore, followed by a train ride to a fascinating city, the national capitol of Bern. 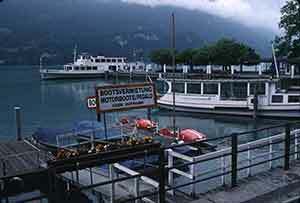 For example, a ship leaves Interlaken at 9:40 a.m. and arrives at the lakeshore town of Thun two hours later, after stopping at eight little villages along the way. You don't really need to get off and visit these villages, but looking at them from the boat is quite enjoyable. Be sure to get a good look at the Romanesque castle at Spiez, towering over the village on the lakeshore. It is open as a museum, so you might be tempted to disembark here for that special visit, easily walked from the dock. If the boat ride does not appeal, you could take a 30-minute direct train from Interlaken West station to Thun, and stop off for a brief visit on your way to Bern. 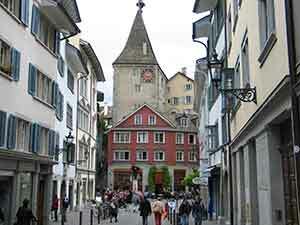 Thun has a well-preserved Old Town, with cobbled lanes, a wonderful old main square, rows of shops two levels high, and many buildings that date back to the Middle Ages. The town center is just a few blocks from the boat docks and the train station, and can easily be explored in one or two hours. This little town has been described in some guidebooks as one of the prettiest, so perhaps you should look for yourself. When you have seen enough, walk over to the train station for a quick ride to Bern. It only takes 20 minutes for the train to reach Bern from Thun, with several departures every hour, so this is a very easy trip to a rewarding destination, and the return to Interlaken by direct train takes just one hour. The Bern train station is right next to the Old Town, so your walk through the historic zone begins the moment you arrive. Just in front of the station is one of Bern's important churches, the Church of the Holy Ghost, considered the most elaborate Protestant baroque church in the country. Among all the pretty towns of Switzerland, Bern is unique because most of the sidewalks in the historic section are covered by old arcades that continue for nearly four miles along most of the streets in the center. The stone arcades offer protection from sun and rain, but more importantly, create a special atmosphere that is somewhere between being outdoors and inside. As you walk along the covered sidewalks there are interesting views framed by the arches, columns, flower boxes and windows that give pleasure everywhere you turn. People still live in the upper floors, which makes this a vibrant mixed-use community with bakeries, shops and cafes for locals as well as visitors. Because the buildings are small, department stores and franchises have stayed away, leaving most of the retail space for unique shops and galleries. 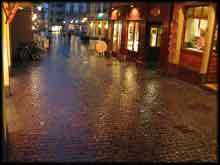 This historic section is only five blocks long and five wide, ideally suited for a walking tour, immersed in buildings that have not changed much since the Middle Ages. It is such a historic gem the town center has been designated a UNESCO World Heritage Site. The historic center of Bern is surrounded by a sharp curve in the Aare River, which defined the town plan, offered protection, enclosed the space and encouraged growth in a compact arrangement of shops and homes that fit perfectly together. We could learn a lot about how to build our modern cities by studying these organic growth patterns that evolved over the past 900 years. The main street proceeds directly from the train station through the historic center, changing names five times in its five blocks, with shops all along the way. This road is remarkable not only for the ancient buildings and arcades that cover both sides, but for the spectacular Renaissance fountains down the middle. 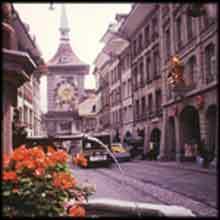 Two covered arches at both ends of the Marketgasse block include the famous Clock Tower, the oldest building in town, whose astronomical clock still works after 500 years. Try and be at the clock four minutes before the hour to catch the whimsical parade of mechanical bears, armored knight, jester, lion and Father Time celebrating the moment. Einstein lived on this main street for eight years while developing the General Theory of Relativity, and his house is now open as a museum. There is a fine art museum, with the world's largest collection of paintings by Paul Klee, who lived nearby, and many important European masters, including a nice sample of Impressionists. Another important building is the gothic Cathedral, with the nation's highest church tower which you may climb for a birds-eye view of the historic center. When finished, take the train back to Interlaken for the evening. 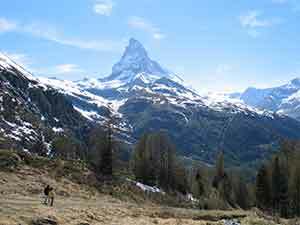 Our next destination is just a few hours away by train, through more postcard scenery, past picturesque mountain pastures, across rushing torrents, and through steep-sided narrow valleys, which brings us to Zermatt. We settle into this popular village and look up to see the most famous mountain in all of Europe, the Matterhorn, which rises to an altitude of 14,070 feet in a distinctive vertical thrust-one of the most dramatic sights in the world! 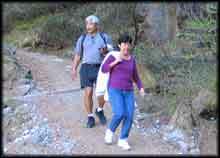 We will enjoy a variety of activities here, including pleasant walks on the easy trails that lead out from the village. There are no cars allowed in town, so we can really relax and enjoy the peace and quiet, amidst the spectacular setting of Alpine peaks all around us. Our first orientation walk will take us through the village past the various shops and restaurants, and point out the cablecar and mountain rail lines. This first afternoon will be a good time to ride the comfortable Gornergrat rack railway, one of the highest in Europe, for stunning look at dozens of mountain peaks all around you. Here you will see dozens of snow-covered mountains reaching above 12,000 feet, displaying one of the most amazing mountain panoramas in all the Alps. This is the very center of the Alpine structure. 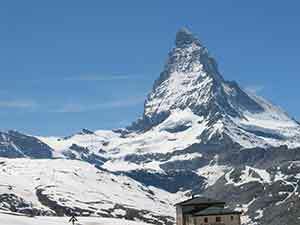 On our second day you can experience a most spectacular activity with a ride up Europe's highest cable car to the Kleine Matterhorn, at 12,533 feet, offering a close look at the famous Matterhorn. 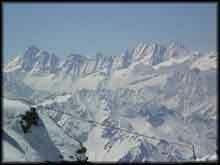 People ski year-round at this extreme height, so you will see lots of snowboard and skiing action. On the way back down you can get off the cablecar at an intermediate station and walk the rest of the way down the mountain on a very easy, gentle trail through meadows filled with wildflowers, and more majestic mountain views. It just takes a few hours and is one of the nicest, easy hikes of the tour. 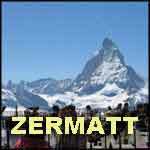 We will find that there is a lot to keep us busy during our two days in Zermatt. It is one of the best places in the Alps for nature walks, ranging from the gentlest stroll to more vigorous hikes in the mountains. There are a number of Alpine lakes with easy trails that will lead you there and back with no strain at all. The rewards are many: beautiful views, uncrowded trails, fresh mountain air, downhill paths, wildflowers in bloom and scenic rest spots along the way. Zermatt is one of Switzerland's most favorite destinations, surrounded by gigantic mountains piercing the sky, with beautiful paths reaching out in every direction, calling you to come for a splendid scenic stroll. This famous resort offers old-fashioned charm with all the modern comforts. Horse-drawn carriages or electric carts - vigorous mountain walks, or relaxing cafes - quaint chalets, and small shopping malls. Here you can truly have it all. You can easily spend the entire day out in the mountains, walking, riding, eating, and enjoying the astonishing views. From here we embark on another spectacular train journey that takes us from Zermatt out into the Rhone Valley, to Brig and the Oberwald pass. 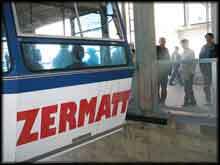 You are getting the very best of Swiss engineering, with their unique ability to take a train almost anywhere, with utmost comfort. 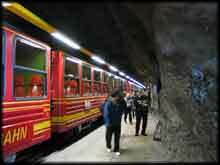 We change trains and then travel from Domodossola to Locarno, one of the most glorious, scenic journeys in the world. The rail line passes through 17 remote Alpine valleys, each surrounded by majestic mountain peaks, in another miracle of Swiss engineering that brings you deep into the Alps with complete safety and comfort. We're travelling next to a rather surprising part of Switzerland that you might not recognize at first: there are bright, colorful flowers, pastel colored buildings, some with arcades and the people speak Italian, but yes, we are still in Switzerland. 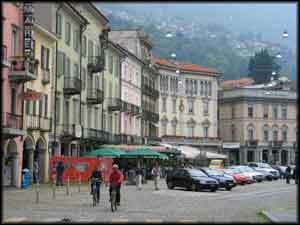 This is the southern part of Switzerland in the region known as the Ticino where we are visiting the town of Locarno. 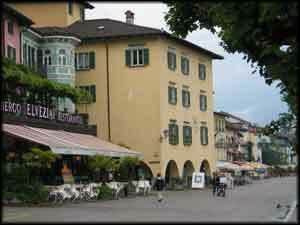 This is a pretty little resort town along the shores of Lake Maggiore. It's a fascinating region of Europe with the best of both worlds: the romance of Italy and the efficiency of Switzerland, making the perfect combination. This town has an Italian feeling even though we are still in Switzerland. 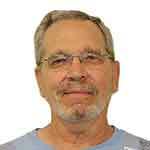 Most of the locals don't speak any Swiss German or French -- just Italian and perhaps a little English, especially those who are working in the shops and restaurants. Shop clerks and waiters are multilingual and so you don't have any problem getting taken care of, even in the little villages nearby. You can easily find pizza and pasta, because the main cuisine here is Italian. 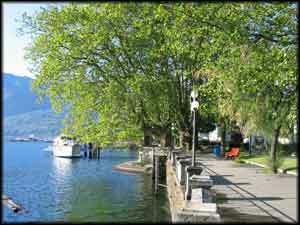 Locarno has a Mediterranean climate, so you will even find palm trees growing – quite surprising for Switzerland! In late May and early June the temperatures are just perfect for sitting outdoors and enjoying the very pleasant temperature, perhaps at one of the sidewalk restaurants near the main square. The old town is lined with narrow streets, and in the center cars are prohibited – it is strictly for pedestrians which makes the town lovely for walking. Nice and quiet and peaceful here and there are a few little hotels sprinkled around in the old town, and of course some excellent restaurants and a variety of shops and historic sites, including a castle and several old churches in the Italian Baroque style, with charming old-fashioned architecture throughout. 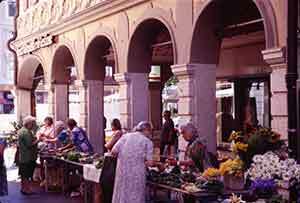 Piazza Grande is the main square with a picturesque arcade along one side with lots of restaurants, gelato shops, cafés and little stores to browse in, with a nearby morning food market. They also have a casino where you could try your luck. 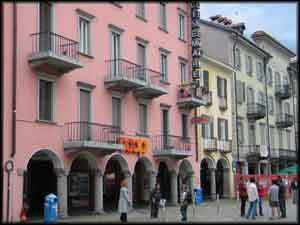 Locarno's Old Town extends for about six blocks by four blocks so it's not really huge but it's big enough to enjoy a nice stroll and browse in the shops, art galleries and antique stores. 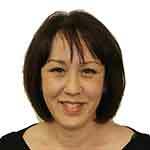 Shopkeepers are friendly and welcome you to come in to look around. You'll find quite a few modern stores intermingled with the old, scattered among the hidden lanes and quiet spaces in the back of the town. There's a nice shady, cozy feeling in the narrow alleys where you can walk from one end to the other. and there are some smaller piazzas tucked away on the side streets as well. You could easily spend a few hours just meandering and strolling, getting a little bit lost -- but you'll quickly find your way again in such a little place this. 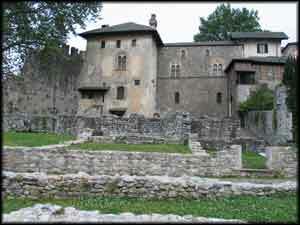 One of the main historic highlights is the old Visconti Castle, where you can have a look inside at the display featuring period rooms with ceramics and glassware, along with artifacts from the surrounding region. There are original frescoes on the walls and well-preserved old columns with various ancient architectural details. This Castle has a primitive feeling -- you could almost be back in the day 500 years ago when there were some elegant banquets in these rooms. They've done a very nice job renovating the Castle and installing modern display cases, some with ancient Roman glass from 2000 years ago found in the vicinity. They conducted archaeological excavations outside and found Roman artifacts on the site, among the original Roman arches and walls. 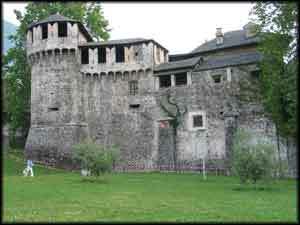 The castle is conveniently on the edge of the old town of Locarno so just takes an hour for the complete visit. The church of St. Francis is the oldest in town, dating from the 14th century, with a nave dating from 1528, presenting a mix of the Gothic style and the early Renaissance. This is a cool sanctuary in the midst of this quiet town. 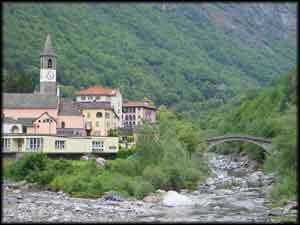 Another great activity to enjoy while in Locarno is to head into the mountains where you can choose from several different deep valleys, including Val Verzasca, Val Maggia and Valle di Campo. 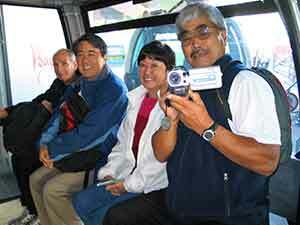 They are easily be reached by a scenic public bus ride in less than an hour. These valleys go deep into the Alps, covered in green forests and dotted with small villages, offering some easy walking paths along the rivers. 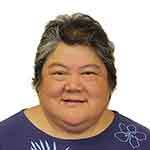 You might enjoy a little stroll for about a mile all along the stream on a level dirt trail that is very comfortable, winding through a pleasant forested valley. Anytime you feel a little tired you can walk back to the road and catch the next bus coming by, perhaps stopping for refreshments at one of the villages. Some valley scenes look like they popped right out of a postcard, with old stone arched bridges and clusters of stone houses, many of which are abandoned now. The buildings are made from rocks quarried nearby – there is lots of good quality stone available in these valleys so local builders took advantage of this abundant material to construct sturdy homes that have stood for centuries. Most of the residents uprooted themselves in the 19th century due to poverty and moved to California where they established a winegrowing industry that they called Italian Swiss Colony, still a famous name today. The people still living here seem to be doing fine: this is modern Switzerland after all, which has a strong economy. The occupied buildings are nicely maintained, but they look ancient, kind like hobbit homes that have just grown up organically out of the earth. Another entertaining activity to enjoy is a boat ride on Lake Maggiore, a huge lake, 40 miles long – the second largest of the Italian Alpine lakes after Garda. The lake goes for many miles into Italy, to Stresa and the Borromean Islands, but you can just take a short boat ride for about 15 minutes across this little inlet of the lake to the village of Magadino. Boat traffic begins early to serve commuters, so you can go down to the lake and take an early morning ride. 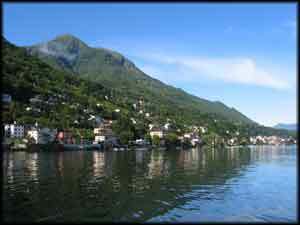 You get a nice view from the boat looking back at Locarno and can see how the village is surrounded by the mountains, with snowcapped peaks in the distance and the valleys beyond. There are some much longer boat rides available on Lake Maggiore: you could go for 3 1/2 hours if you wanted to travel to Isola Bella in the Italian part of the lake, near the town of Stresa, but that would be a full-day round-trip excursion. 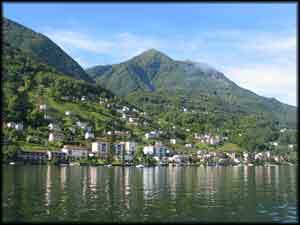 A wonderful excursion is a short bus ride over to the nearby village of Ascona, which only takes about 12 minutes on the city bus, or you can go by boat from Locarno. 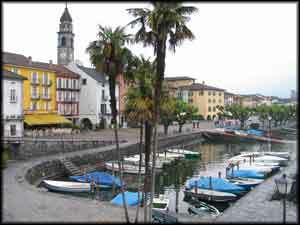 Ascona is a pretty little waterfront village -- another one of these picture postcards come to life. It's got the expected waterfront promenade with shops, town center, church, an open market, sidewalk cafés, some arcades, and quite a few streets that are just for pedestrians in that typical European style. It's a little resort town with pastel colored buildings, small boats bobbing in the marina, tiny back lanes for an aimless stroll, enough shops to keep you busy, a main pedestrian artery, and there are at least one dozen excellent restaurants here, so you will not starve. 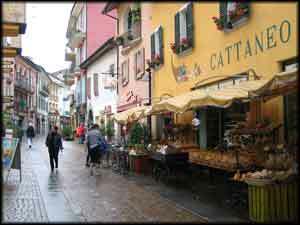 LUGANO We’ll also take a day-trip to the beautiful town of Lugano, enjoying narrow cobbled streets and squares, morning markets, small arty shops, and a lakeshore promenade lined with fountains and flower gardens. 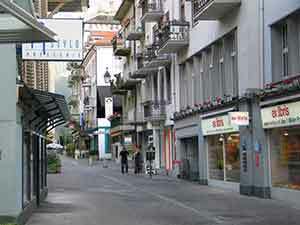 Much of the small town of Lugano is devoted to the pedestrian, with shops and cafes, and a waterfront promenade with vistas across the lake. The view from Lugano’s waterfront is an unforgettable picture of shimmering blue water dotted with white sails, ruffled by the wakes of small craft that ply from shore to shore. It is a picturesque spot for a tasty meal on an outdoor terrace of the enticing restaurants that are clustered here. From here we take a short boat ride to visit to the nearby tiny fisherman village of Gandria, a picturesque spot with narrow lanes that climb the hill from the lakeside as gentle staircases rather than streets. Zurich is the world's best city to live in, with the highest quality of life, according to recent studies -- so it is also a perfect place to visit. 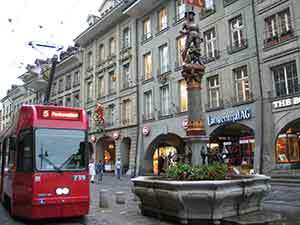 While most people know its reputation as a modern banking center, you will be surprised to discover the historic charms of its extensive Old Town, among the largest in Switzerland. Zurich is ranked number one because of its superb cultural, economic and environmental conditions, and for high scores on other important social criteria, as determined by the Mercer Human Resource Foundation's annual study. Its residents have the world's strongest purchasing power, primarily because of their high incomes, in this is financial capital and largest city of Switzerland. Visitors can take pleasure in its wonderful lifestyle, enjoying friendly, efficient services while exploring many fascinating sights. With just under 400,000 people, Zurich is an ideal place to stay for two days -- especially when you consider the main visitor attraction: a beautiful Old Town of cobbled lanes lined with historic buildings and numerous fine shops and restaurants. It is delightful to wander in this large pedestrian zone that is filled with enchanting little alleys which lead through an ancient town founded during the Middle Ages. 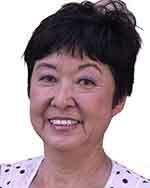 With the right strategies you can see this slightly expensive city without spending a fortune. It's an easy city to cover on foot, which is always the best and cheapest way to see any historic town. 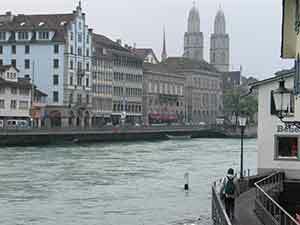 Zurich might conjure up images of conservative bankers and businessmen in pinstriped suits and the world's third largest stock exchange, but the city throbs with culture, fashion and a zest for life approaching that of Paris, Rome and London, but without the crowds and traffic congestion of those larger cities. The Swiss are famous for their efficiency, safety and cleanliness, but you might be surprised by Zurich's hip style and cutting-edge scene. This charming, compact city is situated on the picturesque waterfront shores of Lake Zurich, with the Limmat River running through the center of town and the snow-capped Alps visible in the distance. The Old Town extends about five blocks in from both sides of the river and stretches for about a mile. The right bank, or east side, of the river has the larger cluster of old buildings and is considered the prime district for visitors. 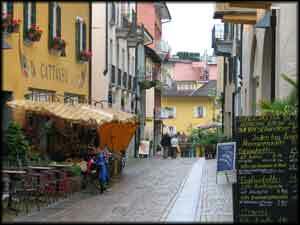 Much of your first day can be devoted to exploring its many little side alleys and shops. 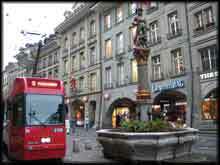 Across on the left bank you will find Zurich's most famous street, the Bahnhofstrasse, running about 1,200 yards from the main train station to the lake, and lined with elegant stores, department stores, restaurants and small boutiques. 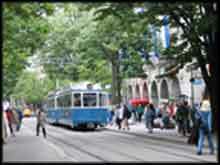 It is a lively yet quiet street scene for it is limited to pedestrians and trams. This is shopping central for ladies clothing as well as a business center for many major banks and offices. 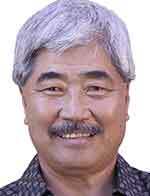 Billions of dollars in gold bullion are stashed away in corporate basements beneath your feet. The neighborhood between Bahnhofstrasse and the river offers a lovely chunk of the Old Town to wander through, with several important historic sites to see. The modern part of town extends beyond the historic center for several miles and includes a greater metropolitan population of one million, but the visitor doesn't need to venture into those distant neighborhoods. Our suggestions will enable you to fully explore the Old Town and get the most out of your time, including visits to the surrounding mountain scenery and some nearby towns. Today's itinerary could be summarized as simply wandering up and down nearly every little lane in the Old Town, which is an ideal version of the best imaginable collection of historic buildings set amid a delightful tangle of narrow, cobblestone pedestrian alleys. Disney could not have done it better, but this is the real thing. Leave it to the Swiss to preserve their past and maintain these 500-year-old buildings in perfect condition. There is not a single ugly or boring moment to break the spell. No modern buildings are allowed here, and everything is kept spotlessly clean, so you are not going to see graffiti and trash, or beggars, addicts and thieves, but instead will be treated to life at its best. Most shop interiors are quite new but the exteriors are vintage. Conditions really don't get much better than this. A good place to start is where the city began, at Lindenhof, a small, tree-covered park on a low hill overlooking the heart of town. Like many European towns, Zurich was founded by the Romans, who set up headquarters on this hill as an outpost for their expanding empire. It is believed the first scattered settlements sprang up four thousand years earlier as pole houses in the lake, but those initial residents left few artifacts. From Lindenhof you gain a fine view across the river to the main section of the Old Town, where you will notice the tall spires of the Grossmunster, Zurich's main church and signature sight, along with several other church steeples stabbing the sky. Exit Lindenhof down the south steps along Platzgasse, which will lead you past one of the few Roman ruins visible in town -- a simple marble column on your right with inscriptions containing the first known mention of the Latin name for Zurich. At the foot of the Lindenhof hill you face a maze of five little lanes radiating out in all directions, but don't worry about which way to go: this is a good place to get used to the idea you are going in every direction. This cluster of alleys is really one of the nicest parts of the city, so walk a few short blocks along one route and circle back along a different lane to where you started, then pick another circuit. You could spend an hour covering this little patch of short lanes, including the lovely arcaded path along the river called the Schipfe. Be sure to have a good look at Augustinergasse, which has a perfect atmosphere of ancient buildings arrayed on a gentle curved path, luring you along by revealing more charming structures until it reaches the busy Bahnhofstrasse. Another fine spot is Weinplatz, along the river: an enchanting small square enclosed by smart shops and more Gothic buildings. 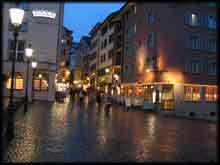 Zurich does not have a single, large market square, but several scattered throughout the Old Town, and Weinplatz is the oldest, with ultimate origins as a Roman port. In the midst of this special network of alleys you can't miss the towering steeple of St. Peter's Church with Europe's largest clock: 28.5 feet across, 500 years old and still keeping accurate time. 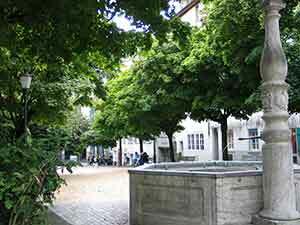 The quiet little square next to the church is one of the most charming spots in town. St. Peter's is Zurich's oldest parish church, first built in the 7th century with the Romanesque tower added during the 13th century. It's worth taking a quick look inside at the Baroque stucco decorations. 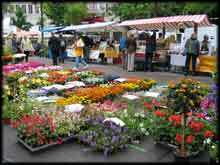 The lakeshore is two blocks further, scene of a lively, morning market selling flowers, cheese, breads, fruits and vegetables. We shall walk along the elegant Bahnhofstrasse, one of Europe's finest boulevards, lined with thriving, modern retail frontage from end to end. No cars or trucks disrupt this pleasant shopping atmosphere -- only pedestrians and quiet electric trams gliding by. This is how a city should function and could serve as a model for any metropolis aspiring to show a human scale in the middle of its urban center. 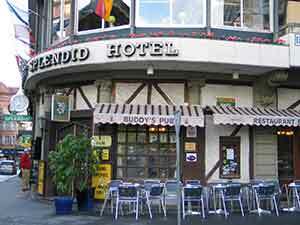 Plan on spending the afternoon exploring the main section of Zurich's Old Town, across the river on the right bank in what is conveniently called the Niederdorf, after the main street of this side. Niederdorfstrasse is one of the great historic streets of Europe, perfect in every way. 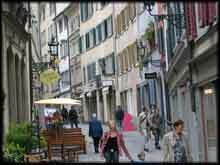 It has been the main lane of Zurich since the Middle Ages and is still the major route for visitors to explore today. Niederdorfstrasse stretches for nearly one mile from the train station area to beyond the cathedral and is limited to pedestrians the whole way. 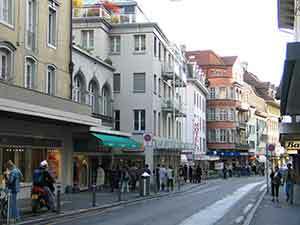 Typical of European streets, it changes names a few times, becoming Munstergasse, Hirschenplatz and Oberdorfstrasse, but is basically the same road throughout. Paved with cobblestones and lined with historic buildings hosting modern shops, cafes and restaurants, Niederdorfstrasse is a place to linger and enjoy. Sometimes it widens to form small plazas as it intersects with other lanes, but mostly it is just twenty feet across. This medieval street curves here and there, and rises then drops slightly as it continues in a most pleasant pattern. 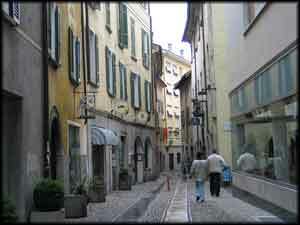 Dozens of small lanes branch off both sides leading further into the magic of the Old Town. The neighborhood is just the right size: small enough so you cannot get lost or exhausted but large enough to keep you discovering new sights for a couple of days. 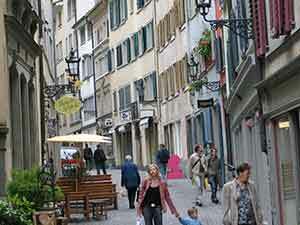 You can easily fill out the afternoon by meandering through this fascinating network of alleys, exploring the little shops and enjoying the variety of traditional Swiss buildings. You'll want to drop into many of the stores in this district to see what treasures are hiding behind their small windows. 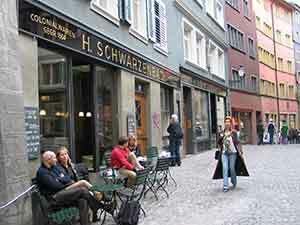 One food shop you would enjoy is Schwartz, selling dried fruits, nuts, fresh-roasted coffee beans, chocolate and many gourmet treats, with a casual café on the corner. A great way to begin the second day is take yet another leisurely stroll along the main lane of Niederdorfstrasse to its end at Ramistrasse, catching a few more sights you might not have had time for the first time around. As you continue along the main pedestrian lane of the right bank you will reach the main historic site of town -- the Great Cathedral, or Grossmunster, a huge Romanesque church dating back to 1106. This is where the Protestant Reformation began in Switzerland in 1519, two years after Martin Luther began his crusade in Germany. 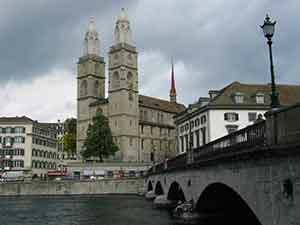 The cathedral is the symbol of Zurich, with its two huge 15th-century towers topped by 18th-century domes. If feeling energetic you could walk up the west tower for a stunning view across the city. Leaving the Grossmunster, proceed a few blocks along the last stretch of this main pedestrian lane, now called Oberdorfstrasse, then turn left on Ramistrasse to visit the Kunsthaus art museum, just five minutes away. Walk behind the Kunsthaus to the busy Heimstrasse, then turn right on Kunstlergasse which leads in a few minutes to the University of Zurich, Switzerland's largest, with a campus that includes the Zurich Polytechnic and University Hospital. Behind the train station, the country's largest museum occupies a huge Neogothic castle built a century ago and houses a grand display of history illustrating the full length of human culture in Switzerland from the Stone Age up through the 1940s. Two vast floors with lofty ceilings take up most of a city block and offer 80 different galleries filled with remarkable art and artifacts. Walking through these ancient rooms is like traveling back five centuries to the Renaissance, for you are totally immersed in the displays rather than merely looking at objects sealed up in glass cases. A wide variety of day-trips available from Zurich to nearby towns and mountains could take up much of your third day: these include boat rips on the lake, rail journeys to nearby towns or a short jaunt up to the nearby mountains for a view.The main boat operator, Zürichsee Schifffahrt, has 17 motor boats for tours ranging from 1 to 7 hours, with meal and snack service on board. An easy visit from Zurich is to the nearby mountain-top at Uetliberg, 2,858 feet elevation, with a fine view of Zurich, the lake and the Alps. 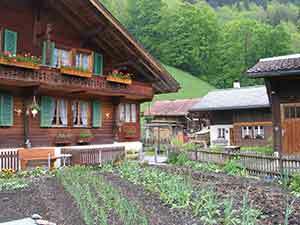 It takes just 40 minutes to reach from Bahnhofstrasse by walking to the Selnau train station and taking a short rack railway ride up the hill. From here you could take various hikes through the woods, including a 2-hour stroll along the ridge to Felsenegg, where you can take a cablecar down to the S-Bahn for the short ride back to Zurich. Another nearby town with wooded trails and views is Sihlbrugg, just 30 minutes south of Zurich by train. 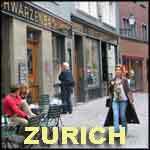 Zug and Chur are two other major towns within a reasonable distance from Zurich. The former only takes 25 minutes to reach by rail and offers one of the country's prettiest and largest pedestrian Old Town zones, with cobblestone lanes, hundreds of medieval buildings, a castle, museum and plenty of restaurants. 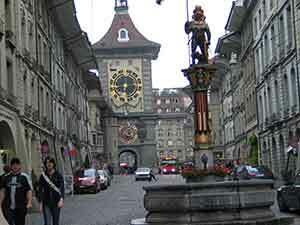 Day-trip possibilities from Zurich are endless in this transportation hub of Switzerland. Of course, another fine option is simply to stay put in Zurich and continue your walking explorations, discovering more hidden corners of this incredible city. Next morning we fly home. 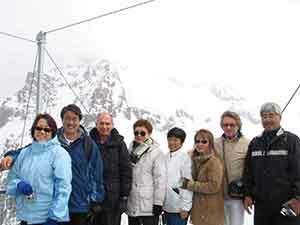 Thank you very much for an exciting trip to Switzerland. We learned so much from all the places we visited – educational and fun – and enough time to explore the nooks and crannies. We will recommend your trips to our friends. 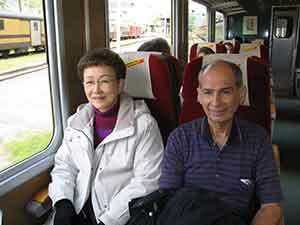 Traveling by first-class train was wonderful -- comfortable, relaxing, spacious – great way to enjoy the beautiful scenery. We marveled at the Swiss engineering – how they have made their natural beauty accessible by boring tunnels through seemingly impossible mountains, erecting cables for cable cars from mountaintop to mountaintop, and building railways up to Alpine areas. 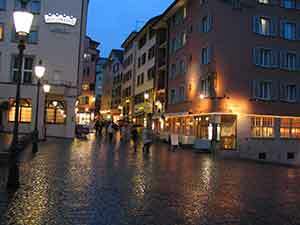 We enjoyed staying in hotels in the Old Towns – walking through the streets is the best way to get the feel city. 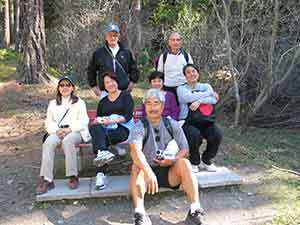 There were many hiking opportunities – another good way to experience the ambience and beauty of the places. The transportation system was efficient – coordinating schedules with rail, bus, both and smooth transfers from one mode to another. Best experiences: 1) walking tours. 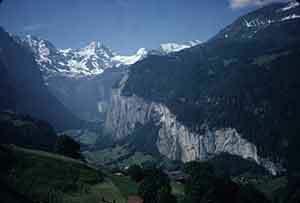 2) train rides to Murren, Lauterbrunnen and Jungfrau 3) seeing the mountains close up – magnificent, breathtaking. 4) walking on the mountain path down to Zermatt. 5) Dining in restaurants and outdoor cafes. How can I ever forget the gelatti! The tour was very enjoyable and educational. We were able to observe and appreciate some of nature’s best scenery in the world. 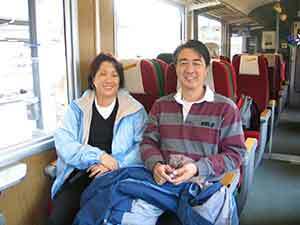 Trains are excellent for travelling. 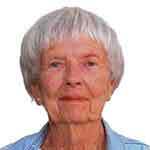 The tour was flexible to meet the needs of the members. 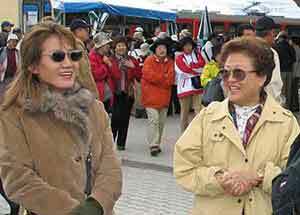 Tour escorts blended very well with the group and made all of us feel comfortable. Choice of hotels and breakfasts was very good. This is one of the best tours I’ve taken. I will cherish the memories of the Alps. I’ve been recommending it to my friends. 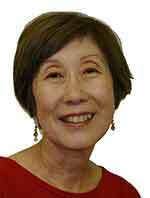 Millie Fukumoto. We saw Switzerland from every possible vantage point ... from first-class trains of every sort, from little cog railways, from funiculars and cable cars, from boats on Lake Lucerne, from sweeping mountain vistas and beautiful valleys, on walks through the towns and cities to hikes in the mountains, pastures and riverbanks. In the timeframe we had to work within, we could not have possibly seen more or done more ... there wasn't a wasted minute. While Lucerne and Interlaken had the most variety of things to do, it would be impossible to pick a favorite day or place. Being in natural settings most of the time versus man-made buildings, museums, etc., is what we liked best about going to Switzerland. Titlus, Pilatus, Jungfrau, Shilthorn, Gornergratt, Kleine Matterhorn, the Lauterbrunnen valley with its countless waterfalls, the little towns and chalets, the lakes ... in short, it is all unforgettable. Nature and man at their best! When we travel, we want simple, healthy food, especially buffets. Thus, we liked the Veggie restaurant you found in Zurich. We also like the good breakfasts to start off the day. 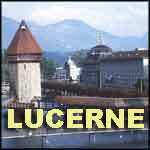 Lucerne and Interlaken topped the list. Also the dinner/Swiss folk show in Lucerne was nice. One of these was plenty. 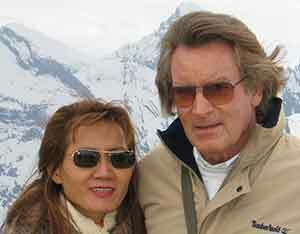 We enjoyed both of the dinners you treated us to in Zermatt ... that was very generous and thoughtful. You set a good fast pace and shrewdly made every minute pay off by miraculously coordinating everything we did with a corresponding schedule. This allowed us to go from one thing to another without missing a beat, wonderful job of planning and getting everyone to hustle. Even squeezing in that side trip to Bern after what had already been a full day! No one could say that we did not get our money's worth. And to top everything off, the weather was perfect on every day that we needed it to be. Somebody up there likes you, Dennis. Taking us to Truummelbach Falls and the glacier valley were both very worthwhile side trips … a must for any future tour. Same for the hike down from Wegenalp. There was absolutely no time wasted waiting to get somewhere ... there was always plenty to see while we were either going or coming from every destination! The itinerary was very good. Just the right balance of variety. Hotel locations were good, as usual. 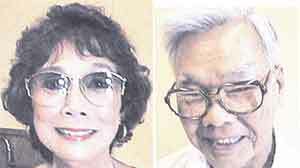 Putting your digital photos on the internet and making them available to everyone was great ... especially since you did it so fast. The leisurely pace of the trip, with two or three nights each place, gave us time to explore and get to know each town well. Trips and tours that you planned were well-selected, giving us the option of what we would do in our spare time, which was a good idea since different people have different interests and could pursue what they liked. 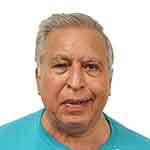 Having you as our experienced guide, who has knowledge of the history, culture, and interesting features in each town, kept the trip running smoothly with little wasted time due to your keeping track of the transportation schedules. Providing us with maps, and brochures in each town was something I appreciated since I like to get an idea of where we are going and what is going on in that town. 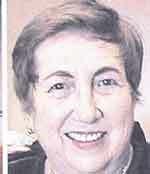 It was difficult to get some of that information and ahead of time, but you gave it to us. The scenery was breathtaking and it cannot be compared to anything I've experienced before. Your expert dissection of the Swiss Railway schedule, coinciding with bus and boat routes, was amazing. Of course, the Swiss are also amazing for figuring and keeping transportation schedules. Time management was excellent on all the excursions. Other wonderful experiences were hotel selections and locations, knowledgeable tour commentary; meeting other nice travelers, weather (most of the time) and just enough time to do your own explorations and getting lost a few times was fun too. A big, full breakfast is very important to finish the daily excursion. I think this was a good plan.